Bring a piece of iconic design to your home. 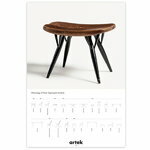 The Artek Poster called the 2nd Cycle Pirkka presents the Pirkka stool which alludes to the forms of Finnish rustic furniture. The Pirkka stool is part of The Pirkka range designed by Ilmari Tapiovaara in 1955.